Are you always running late or just want a quick makeup routine for everyday? 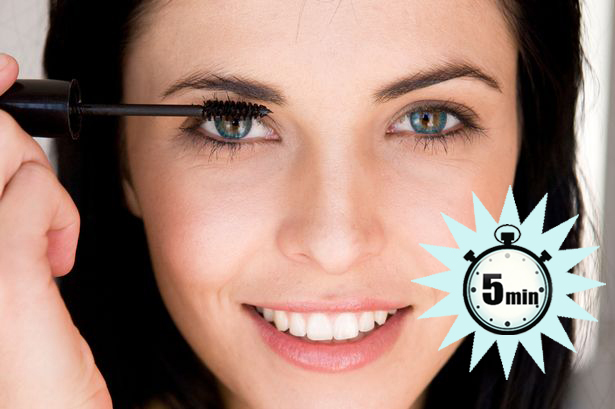 Whatever your needs, we've got a quick 5 minute makeup tutorial to get you out the door. A great base for your look is a multi-tasking beauty cream. Pur Minerals CC Cream saves so much time because it's a moisturizer, primer, concealer, sunscreen and foundation all in one! If you're on the fence about using a BB or CC Cream, check out Beauty 101 to see which one is best for your skin type. If you have dry skin, the beauty cream will help hydrate and keep your skin looking fresh. If your skin is combination or oily, swipe on a little Pur Minerals Balancing Act Oil Control Powder to keep your skin looking flawless all day. A quick look for the eyes is to define with eyeliner and smudge with a smudge brush. This will soften the line and add to our "effortless" look. We recommend Osmosis Colour Water Resistant Eye Pencil for long-lasting wear with the gloMinerals gloTools Smudge Brush or the all-in-one Pur Minerals Eye Defining Pencil with Smudger. Mascara is our go-to makeup product. For a quick and perfect look, choose a formula that thickens, lengthens and dries fast so you can skip the lash curler and don't have to worry about it smudging. Keep lips smooth and hydrated with a balm or swipe on a moisturizing lipstick for a pop of color. Really in a rush? If you don't even have 5 minutes on your hands, use a multi-tasker like Pur Minerals Pur Rocks. It adds a little color and the perfect glow to eyes, lips and cheeks. What's your go-to makeup product for a quick and easy look?